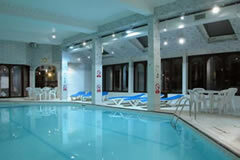 Leisure Club in hotel - £4.00 for an adult and £2.00 for a child. 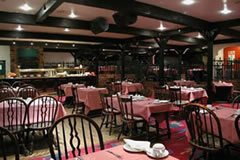 The Britannia Country House is situated in Didsbury, 4 miles from the airport. Where stated in the room description, dinner inclusive meals will be two courses in the restaurant. All rooms have en-suite bathroom, tea and coffee tray, TV, radio, direct dial telephone, trouser press and hair dryer. There are two suitable rooms within the hotel, please request at time of booking. At the discretion of the hotel, parking is on site in the hotel car park. Transfers run between 03.30 - 21.30 - (outside these hours you will need to arrange a taxi to and from the hotel ) - approximately every 45 minutes. The exact times will be confirmed when you arrive at the hotel. Restaurants:- Where stated in the room description, dinner inclusive meals will be 2 courses in Jenny's restaurant served 18:00 - 21:00 each evening. The Overstuffed Pizzeria opens 5-11pm also serving pasta dishes, steak dishes, salads and hot sandwiches. Bars: - Java Lounge Café Bar, open all day and Jenny's Bar for evening drinks and the Residents Bar from 14:00 to midnight. Within the hotel there is a Leisure Club with pool, gym and sauna with Hair & Beauty Salon.Charge of £4 per adult per visit, children up to 16, £2.00 per visit. Children under 16 years of age must be accompanied by an adult and are not permitted in the gymnasium. Children sharing a room with adults must be 15 years or under. Some of the family rooms at this hotel consist of a double or twin beds with bunk beds for the children. Please note - the hotel no longer has a night club. Where dinner is included it will be a 2 course meal in the restaurant. This was a terrible experience. We had someone banging on our door at 5am before we left because the steam from the shower had set off the fire alarm. We were told it was a recurring problem in this room ( then why don't they fix it!!) On our return from holiday, at 10.30 pm, we phoned for our lift back to the hotel and were told it would be a 35 min wait, which we were very unhappy about. We went up to the top floor of the outside multi- storey car park as directed, to wait. We made a number of calls when it didn't arrive and were told 2it was on its way". We had to wait 65 MINUTES in the cold and damp - a bad start to a long drive home. There ere 3 other couples all waiting for the taxis back to the same hotel. I will not be booking again. 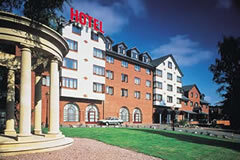 Great hotel not to far from Airport, nice rooms and staff are helpful good value for money when using the parking too. Great to relax the night before your holidays will continue to use this company. We booked our stay here as we had an early flight the next morning and we'd previously stayed here too. Our room was on the ground floor on this occasion and was small but clean and comfy. Sadly our nights sleep was marred heavily by other thoughtless guests talking loudly outside our door and slamming of doors into the early hours which ended up with us getting no sleep whatsoever. It's a shame and we would use this hotel again as its very convenient for us and the staff are very helpful. However I'd ask not to be in that part of the hotel again due to the noise issues with the ground floor. We were completely satisfied with the room etc. We used the pizzeria, which was average. The pick up was efficient. Easy to book and good price. Will use again. Cheap, cheerful, nice room and facilities. Very cheap car parking too while away. Car park - arrived there to leave my Audi A3 on a flooded carpark - this is basically a carpark with a hotel and not a hotel with parking facilities. You could not exit your vehicle without standing in 4 inch deep water. Hotel reception - service was poor by staff who could barely string together a conversation using the English language. I booked a double room and was told there was only a twin room available to the "Christmas parties" taking place. Hotel room - the whole hotel is tired and there is a musty smell reminiscent of hotels 30 years ago - as you walk through each door to your room the carpet changes and you go back another decade in time - a tobacco smell is also evident despite this being a smoke free zone. The beds were of poor quality and flexed under my weight (16 stone) (definitely not up the standard of the standard of a Premier Inn I stayed at only a month ago). We both had a terrible nights sleep prior to our long haul flight. Restaurant - the booking "2 course meal for 2" - this was in fact a self service buffet consisting of lukewarm "hot" foods and some meat in gravy (possibly the same menu as being offered at the Christmas parties. Taxi transfer - no issues with the taxi transfer on the way to Manchester Airport. The return taxi at 0300hrs was terrible - I followed the instructions and rang the taxi provider - told me taxi was on the way eta 0310hrs - 1st lie, rang again given a different ETA 0330hrs and told to go to the top of the multi-storey car park and wait in the lobby - another lie - after over an hour had passed I rang them again (same lad answered the phone each time and denies saying a taxi was on its way saying I had to wait until 0430hrs for a transfer. I challenged this, he hung up and then a minute later a message was sent telling me a Skoda Octavia had been deployed with an ETA of 4 mins. I would definitely not recommend this hotel or the transfer service provided - sleep in your own bed and then park in the multi-storey at Manchester Airport. Check in was speedy and the receptionist was friendly. Room was clean and spacious. Plenty of parking spaces and the transfer to the airport at 03.30 hours was good. My only moan was the guests either side of our room, they were so noisy and loud. Good location and service, clean hotel. Would defiantly book again if flying from Manchester in the future. Like faulty towers. Your car is not safe in the car park. We had our windows smashed in plus another 7 cars. Great place to stay, relax before you go abroad. Transport to airport and back reasonable rooms are clean. Hotel staff are helpful always wil book through FHR. 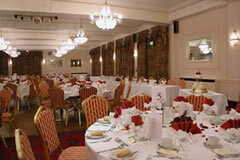 Lovely spacious room, great breakfast and friendly staff! The lift at the hotel was not working when we arrived and was given a room on the 4th floor up about 8 different staircase levels. Couldn't breathe when reach the top. The Room had a small window that opened an inch. It was hot. Asked for a fan but had none left. We stayed again on return after 2 weeks the lift was still out of order. Given room on 2nd floor as stated could not cope with going up to the 4th floor. Still bad. Room was a lot better large 2 large windows still didn't open wide but a lot better. PLEASE NOTE THAT THE M63 & M66 HAVE NOW BEEN RE-NUMBERED AS M60 EXIT NUMBERS HAVE ALSO CHANGED. DIRECTIONS FROM M6-Join M56 for Manchester,go to end of motorway, (look out for end of motorway sign 3/4 of a mile after exit no.3) Take next exit for Northenden(B5166),at traffic lights turn right into Palatine Road-hotel is 1 mile on the left. DIRECTIONS FROM M62-Join M60 follow the signs for Manchester Airport.Exit at junction 5,stay in left lane on exit road and dual carriageway, turn left when you reach traffic lights into Palatine Road(B5166), hotel is 1 mile on the left. There will be a charge for Airport Transfers. £6 per adult return, £3 per child (aged 16 and under) return. This is payable locally at the hotel. Transfers run on a scheduled service approximately every 45 minutes, starting at Midnight. The exact times will be confirmed when you arrive at the hotel. 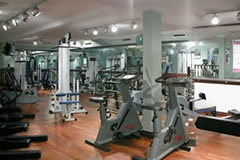 Leisure Club: Per Session:- £4.00 for an adult and £2.00 for a child. Towels are available for hire at a cost of £1.00. Children under 16 years of age must be accompanied by an adult and are not permitted in the gymnasium. Gold Card (allows access to the Spindles Leisure Club for up to one week):- £10.00 for an adult and £5.00 for a child. Please note: Children sharing a room with adults must be 15 years or under. Some of the family rooms at this hotel consist of a double or twin beds with bunk beds for the children. Where stated in the room description, dinner inclusive meals will be two courses in the restaurant. Hi does the price of the nights stay include evening meals The price of the nights stay does not include dinner. can you tell me were you get the shuttle bus on way back to hotelAll of this information is provided when you check in at the hotel as it depends on which terminal that you are flying from.